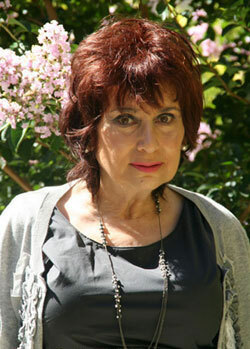 Dulcy is best known as one of the pioneers in Public Access and Reality based television in New York City. Her long running shows "Reel People Review" and "Cable Personals" were recipients of many awards, and included the top celebrities and sports figures of the day. She’s also known as a creator and innovator for light weight mobile filming which opened the door for YouTube type video. Dulcy is truly an industry pioneer and Icon. You may be interested to know why the artist signs her paintings Dulcy Thomas. That is because "Thomas" was part her maiden middle name. Her maternal side’s ancestor, Molly Thomas, was a Maysville, Kentucky, woman who raised 11 of her children as Presbyterians. When a foundling was left on her home’s front steps with a note asking "Ms. Molly, please raise this child as a Catholic even though I know you are Presbyterian." Molly did. Molly was also a modern day entrepreneur having the city fill in land next to her house and then selling it for a significant increase in value. Dulcy has a long history in the arts. Not only is she an artist, but has had extensive experience in the television industry. This resulted in various comedy segments produced, by Dulcy for a television pilot with Carl Reiner of NBC-TV. There was also Dulcy‘s segment "At the Beach, with producer/actor/comedian, Fred Willard for Comedy Central‘s, "Access America." The stage art work, set design was created by Dulcy for her young participating New York Actors. Still later she became a Production Coordinator for The Michael Landon/Children with Leukemia Foundation Awards along with Mrs. Landon and co-producers from MTV/Viacom. Dulcy’s video work behind the scenes of the Leukemia Foundation Awards/First Event is in the Columbia Pictures Archives, Culver City, California. Dulcy produced a segment for Greg Kinnear/Fox Television in the days before his illustrious film career. Later, an International Women’s Day Festival Award, for a video that was broadcast on WBGH/PBS outlet in the greater Boston Area. Following that was a documentary project with East Heights Productions on the life of Margaret Mitchell of "Gone with the Wind" fame resulted in inclusion in Columbia University Archives. A small project for World of Wonder Productions attracted overseas attention from TV-4, U.K., and a French News Television Company, CBNewsTV Dulcy ventured into creating a character (female version of Groucho) television comedy performance. "The overflowing blessings from the fountain of public good and national abundance will be as extensive as our own country and as durable as time." In the early part of the Nineteenth Century (1789), born to James Clinton and Mary DeWitt, was my ancestor (maternal side), DeWitt Clinton. He was educated at what was then named, Kings College, and is known today as Columbia University, after he transferred from Princeton University. On February 13, 1796, DeWitt Clinton married Maria Franklin, daughter of a prominent New York Quaker merchant, Walter Franklin, and descendant of John Bowne and Elizabeth Fones; they had ten children. His second marriage was to Catharine Jones, daughter of a New York Physician, Thomas Jones. There was one child born of that marriage. DeWitt Clinton is best known as the Sixth Governor of New York (1817-1823), as an early American Politician who also held many offices including in the New York State Legislature, and as a United States Senator. Prior to those years, he was Mayor of New York City for ten terms (1803-1815). This was before laws were enacted to lessen the term of office. He is also known as the "Father of the Erie Canal," and as the New York Canal Commissioner (1810-1824), was largely responsible for its construction. He successfully advocated, and won the support of our young American nation for his dream of connecting the Hudson River to Lake Erie; creating the golden path to the west. His vision was strongly disputed by his political opponents, who launched a vicious attack, labeling the Erie Canal project as "Clinton's Folly." Clinton pressed forward through the mire of dispute to build the 363 miles of the Erie Canal, creating a new way to access passage to the west. When completed in 1825, the canal was both practical and economical for successfully moving freight and passengers westward before the advent of the railroad. "Clinton's Ditch" was a whopping Seven Million Dollars; a staggering amount considering the cost of living in those days. The Erie Canal, if constructed today, would cost millions (if not a billions) more. A year later, the Erie Canal not only proved to be economical, but turned a profit from tolls within the first year of operation. The Erie Canal Tolls were abolished in 1883; this was not the case in later canals. In addition, The Erie Canal survived the railroad expansion westward. In 1812, while in the middle of battling it out for endorsement of the Erie Canal, DeWitt Clinton ran for the Office of President of the United States against James Madison and lost by only a small margin. Then, after great public support, enhanced by the positive press for the building of the canal, he was elected Mayor of New York City. Can you even imagine that these days? Remember, he was raising ten children too! As a child, during breakfast, my mother would continually tell stories about this man and his accomplishments. The Erie Canal essentially opened passage to the west; however, it was opposed at every turn. "Clinton's Ditch" or "Clinton's Folly" was opposed because legislators believed that upstate New York's massive morass of forest, swamps, and underbrush was completely inaccessible to overland travel. In fact, most of the western part of New York State was considered unreachable. This is why the proposed 363 mile Erie Canal was considered an impossible project in early Nineteenth Century. In spite of the opposition, this project proved to widen the scope of American lives through its people, ideas, and goods, serving as a model for most subsequent canals. This famous canal is an outstanding accomplishment, and testament to what is now our modern west. In short, this was really how the west was won. 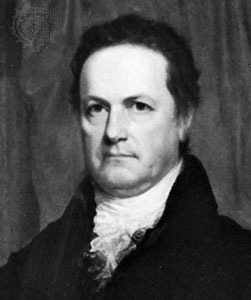 DeWitt Clinton, a Freemason, was elected Grand Master of the Grand Lodge of New York in 1806. They recognized his outstanding community service by non-Masonic organizations or individuals whose actions exemplify a shared concern for the well-being of mankind and belief in worldwide brotherhood of man. In the end, DeWitt Clinton accomplished as much as any leader in civic and state affairs can hope to do. However, he died destitute, and his family did not have the funds for a proper burial. Fortunately, Clinton was a prominent Freemason, and if not for his Masonic friend, his body would not have been buried in a proper resting place; eventually, he was buried in Brooklyn, New York. Indeed, there is much to be learned from one man's vision that reached farther than the passage to the west.